A shopkeeper who kicked an armed robber and chased him out of his shop has said he works too hard to give anything to criminals. Ken Khaira, 63, was opening the Londis in Silksworth, Sunderland, when a man with a knife entered and demanded cash. Mr Khaira, who has owned the store since 1984, said he "instinctively" kicked the man, who then fled. He gave chase but the would-be robber managed to escape, impeding Mr Khaira by pulling a toy stand down in his way. The shopkeeper said: "It was just instinct, I was shocked afterwards but I wasn't scared and I won't be scared. "I will not give in for anybody, I work hard for my family and I'm not going to let anyone else come up and take from me." 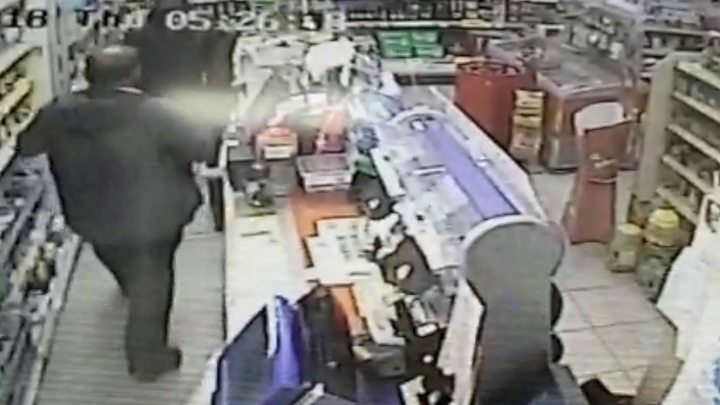 Image caption Ken Khaira said he will not "let anyone else come up and take from me"
Mr Khaira said the robber came behind the shop counter to confront him and held a knife above his head as if ready to strike. He said: "Instantly I just kicked him and he fell back, then he ran off." The shopkeeper said it was the first time someone had attempted to rob him and it has not deterred him from running his business. Police are appealing for information on the attempted robbery which took place shortly after 06:00 BST on 27 September. The suspect is described as white, in his 20s and was wearing all black.